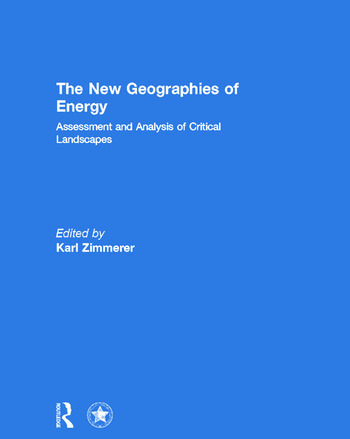 The New Geographies of Energy: Assessment and Analysis of Critical Landscapes is a pioneering collection of new geographic scholarship. It examines such vitally important research topics as energy dilemmas of the United States, large trends and patterns of energy consumption including China’s role, "peak oil", energy poverty, and ethanol and other renewable energy sourcing. The book offers advances in key emerging areas of energy research, each distinguished in the following sections: (i) geographic approaches to energy modeling and assessment; (ii) fossil fuel landscapes; (iii) the landscapes of renewable energy; (iv) landscapes of energy consumption; and (v) an overview of the new geographies of energy (Karl Zimmerer, Annals Nature-Society and Energy issue editor) and an essay on America’s oil dependency (Vaclav Smil, renowned energy geographer). In addition there is a specially commissioned book review. This book was published as a special issue of the Annals of the Association of American Geographers. Karl Zimmerer is professor and head of the department of geography at Pennsylvania State University and a member of the Earth and Environmental Systems Institute. Currently Dr. Zimmerer’s research is focused on three areas: landscape-based social-ecological models of energy, water resources, and food production (Land Use Policy, 2012; Global Environmental Change-Human and Policy Dimensions, 2011; Annals of the Association of American Geographers, 2010, 2011; Roots of Conflict, 2010; Knowing Nature, Transforming Ecologies, 2010); agrobiodiversity and global change (Biodiversity in Agriculture, 2012; Annual Review of Environment and Resources, 2010; Professional Geographer, 2010); and the conservation-agriculture interface (Latin American Research Review, 2011; Mapping Latin America, 2011).